Strap. The heck. In! No more Mr Nice Person! Alun (The Cockerel*) Cochrane intends to drop truth bombs and articulate thoughtcrimes about vegetables, gender, religion and washing machines. *Frank Skinner’s Absolute Radio and various telly, innit. 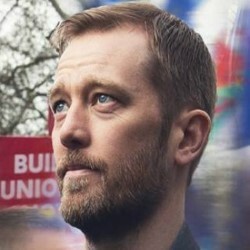 Alun Cochrane has been doing solo shows at the Fringe since 2004. He's performed droll, anecdotal, observational comedy on TV panel games and stand-up shows and he's part of the award-winning Frank Skinner show on Absolute Radio. During these offence-taking times he has decided he may as well be hanged for a sheep as a lamb. Apols to vegans.